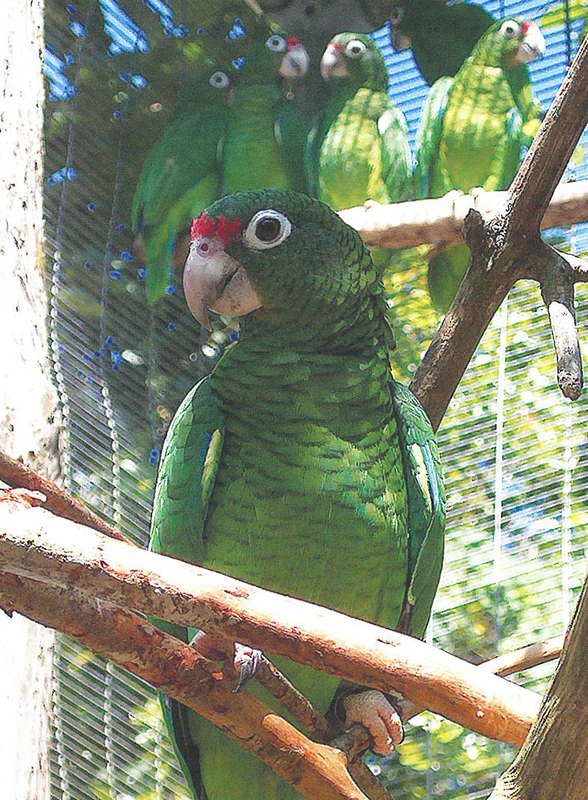 Parrots Over Puerto Rico recounts the efforts of the scientists of the Puerto Rican Parrot Recovery Program to save the parrots and ensure their future. Puerto Rican parrots, once abundant, came perilously close to extinction in the 1960s due to centuries of foreign exploration and occupation, development, and habitat destruction. Woven into the parrots’ story is a brief history of Puerto Rico itself, from before the first human settlers to the present day. 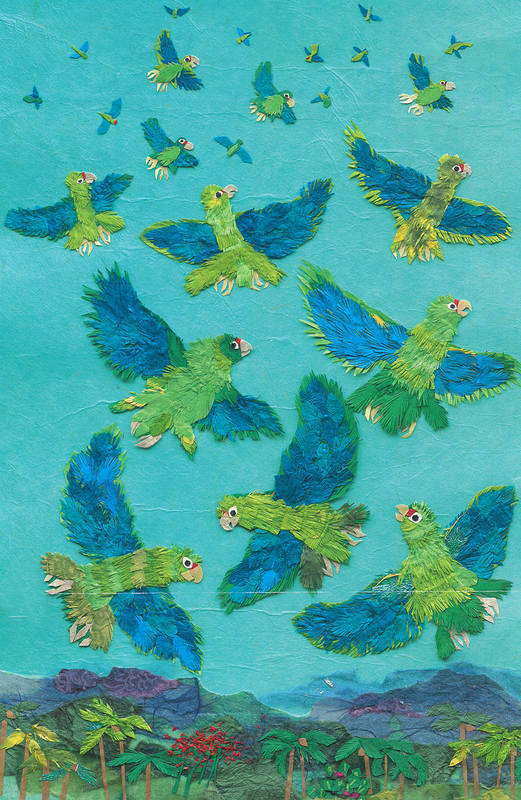 In this BookTalk, Susan L. Roth and Cindy Trumbore discuss parrots, their adventures in Puerto Rico, and the creative process behind their latest book. How did you come across the story of the Puerto Rican parrots originally? Cindy Trumbore: I read an article in the Newark Star-Ledger about the America the Beautiful Quarters program, which features state parks of the United States. There is a 2012 quarter for El Yunque National Forest in Puerto Rico, America’s only rain forest, and the article about the quarter had a boxed feature on El Yunque’s Puerto Rican parrots because a parrot appears on the quarter. That got me thinking about doing a book about the parrots, but the more I read about them, the more I realized the book also had to tell the history of Puerto Rico. Susan L. Roth: Cindy introduced me to the parrots and she taught me almost everything I know about them. Can you tell us a little bit about the research you did for this book? How long did you research before beginning to write? 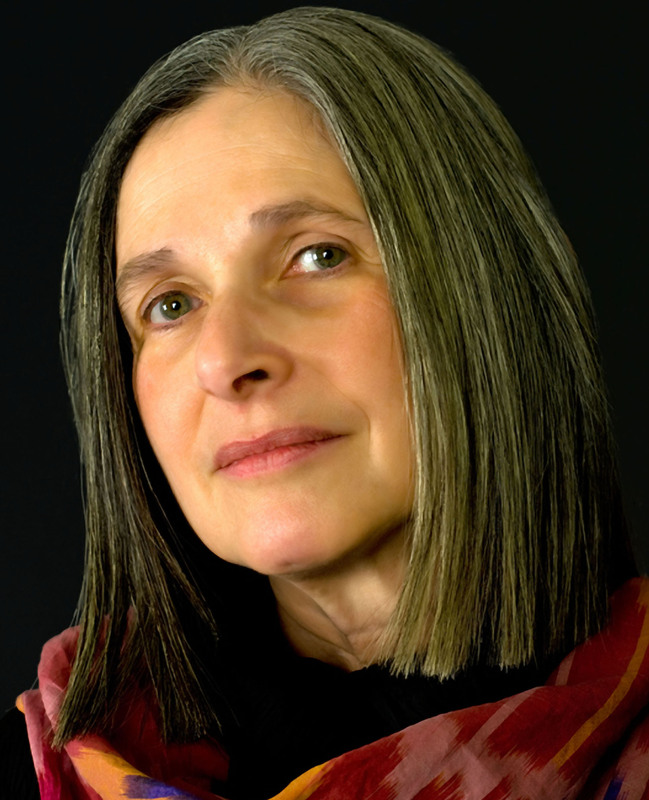 SLR & CT: We did print research for about three months before showing the manuscript to Louise May, our editor. Louise’s questions sent us deeper into many of the texts to find answers. Getting the timeline for the parrots and people parts of the text to advance at the same rate on each spread, which also required finding parallels between the bird and human stories, was especially tricky and required quite a lot of research. In Puerto Rico, we spent a day in museums and El Morro Fort in San Juan to do the visual research for the lower part of the illustrations, which show the history of Puerto Rico. Next we spent a day hiking in El Yunque, taking photos madly, and then we interviewed the two scientists who were our consultants on the part of the text that is about the parrots. Those interviews gave us details and views we could never have found in print. For example, we got to see the tiny protective jacket that a Hispaniolan parrot wears during hawk aversion training for the Puerto Rican parrots. We also got to see the flight cages, nesting boxes, and parrots at the Río Abajo aviary. Can you share with us a highlight or funny anecdote from your research trip to Puerto Rico? CT: For me, the highlight of the trip came at the Río Abajo aviary when the manager, Ricardo Valentín, pointed overhead and said, “Look!” Three of their released birds, a mated pair and a fledgling, were flying overhead. Puerto Rican parrots are still among the rarest birds in the world, so it was thrilling to see three of them. And I think it’s funny that Susan put a view of us in our rain gear from El Yunque—it rained about every forty-five minutes the day we spent there—in the last illustration in the book. SLR: We met Ricardo in his office with a tame Hispaniolan parrot sitting on his hand. This was his special treat, just for us, so that we could see a real parrot, close up. Realizing this bird was not on a leash, I hung back, suspicious and uncomfortable. If it had been a mouse I certainly would have been standing on a chair. Ricardo spoke to the parrot and I suppose it was responding when it lifted up a wing, causing me to shriek (involuntarily, of course). Cindy was mortified to be associated with such a city person. “SUSAN!” she said (read: For CRYING out loud, shut up!). Your first book together, The Mangrove Tree, also has a theme of environmental conservation. What attracts you to this theme? 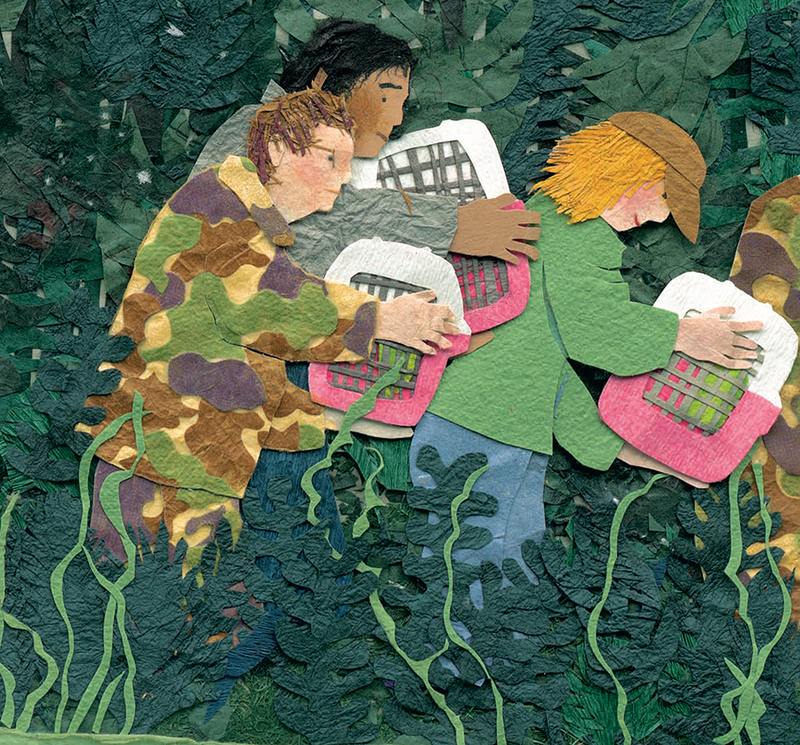 What do you hope young readers will take away from these stories? CT: Each of these stories is inspiring and moving to us personally, and we thought others would be touched too. We think the takeaway for young readers is that individuals, such as Gordon Sato in The Mangrove Tree and the members of the Puerto Rican Parrot Recovery Program in Parrots Over Puerto Rico, can have an enormous impact in helping people and animals. We hope the books will encourage children to believe that they can help solve the problems they see in the world. SLR: My son is passionate about ecology and earth conservation. He has introduced me to many of the complicated problems faced by all of us. I have thought of writing about some of these important issues many times, but often the problems are still too great and still unsolved. As a writer and an illustrator of books for young children, I personally wish to tell my stories with happy, hopeful endings. Both The Mangrove Tree and Parrots Over Puerto Rico are stories where creative, hardworking individuals have recognized serious ecological problems and have worked diligently and successfully toward solving them, therefore permitting these stories to have happy, hopeful endings too. 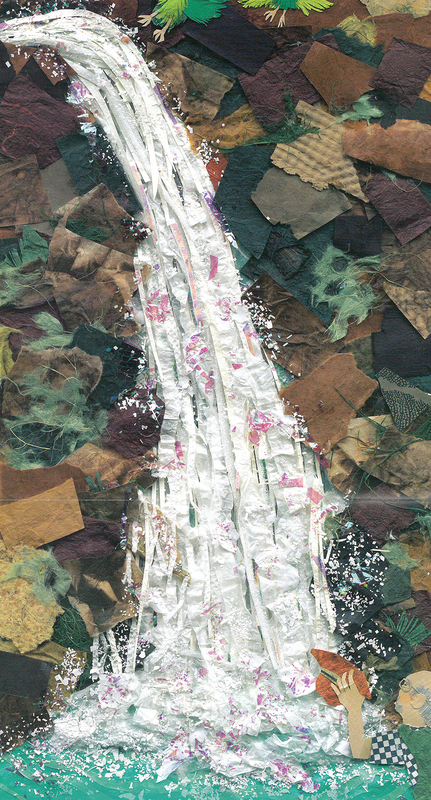 Susan, can you tell us a little about the collage illustrations and how you created them? How long did it take you to create the big parrots on the book’s cover? SLR: I started with color, and picked out all the gorgeous blues and greens in my studio collection before I even went to the art store. I had many, but as always, I “needed” to go shopping too. My collage medium is quite economical since I use so much recycled stuff, so I never have a guilty conscience when I splurge a little—even if I don’t use everything for the intended project, I surely can use it another time. After my studio turned into a study in blue and green and turquoise, it was time to study all our photographs and books. And then, taking a very big breath, I just started cutting. By the time I came to the big cover birds I felt as if I were a professional bird maker. Even though they are so large, I knew what I needed to do, and they grew pretty quickly. The hard part was figuring out how to make the birds look like parrots, and then the harder part was making the “fifty million” little ones. A one-inch long parrot takes twenty-three minutes to make. It never got faster even after I figured out what I was doing. The worst thing that happened every once in a while was that sometimes finished birds learned to fly! There were so many scraps of blue and green and turquoise papers all over the floor and my desk. Sometimes, if I moved abruptly and the papers shifted before I glued a finished bird into its place, it did happen that the little thing would disappear. I sometimes found it during interim sweeping up, but usually I had already made another by the time I found the original. The book has several unique design elements. Why did you decide to make the book vertical instead of horizontal, and to leave the cover without a title and bylines? SLR: This book is an upstairs-downstairs story! I needed ROOM! And so did the parrots! About the cover: I am a great appreciator of the artistic interaction of typography and art, but the birds were so blue and green and turquoise, and they were flying so high with those amazing colors, it just seemed to me it would be more appropriate to let them fly free and high until the title page. 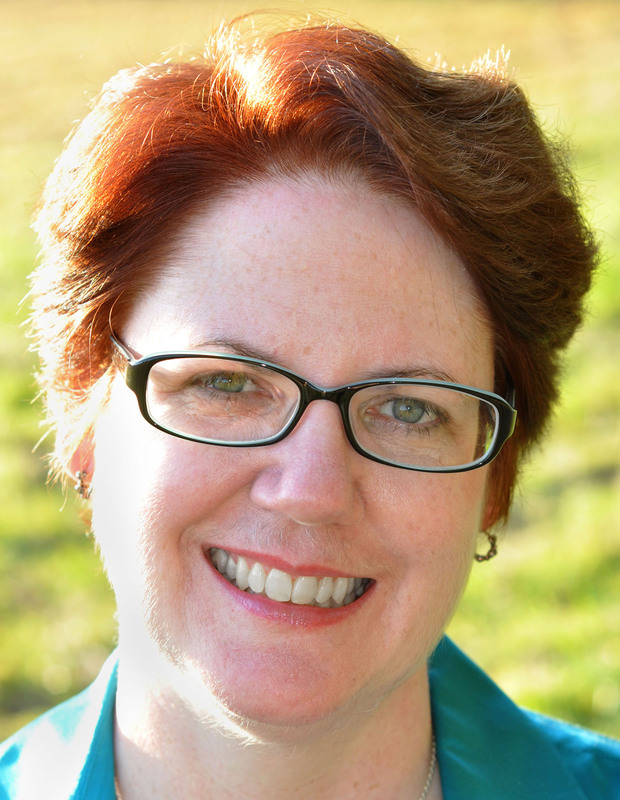 What is your process of co-authoring a book like? Do you get together to write, or go back and forth by phone or email? SLR & CT: One of us goes first with the text. With The Mangrove Tree it was Susan; with Parrots Over Puerto Rico it was Cindy. Then we bat the manuscript back and forth by email endlessly, punctuated by phone conversations and text messages, until we are in complete agreement about the wording. Both of you have extensive experience working on nonfiction books. What do you think makes a nonfiction story compelling? When you come across a news story, how do you judge whether or not it might make a good book? CT: You can’t overestimate the value of a first reaction to a story. If it grabs and moves you, it’s likely to do the same for others. But before I’ll commit to a topic, I first make sure that there are plenty of accurate and varied visual and written sources about it and that we will be able to find a consultant to fact-check. I had identified the two scientific consultants for Parrots before we ever had a contract. I was stalking Ricardo from Río Abajo via his blog. SLR: For me, it’s always amazing that truth IS stranger than fiction!